New Herschel results have given us a remarkable insight into the internal dynamics of two young galaxies. Surprisingly, they have shown that just a few billion years after the Big Bang, some galaxies were rotating in a mature way, seemingly having completed the accumulation of their gas reservoirs. When galaxies form, they accumulate mass by gravitationally attracting vast, external gas clouds. As the gas clouds enter the galaxy, they fall into haphazard orbits. These disordered paths cause turbulence in the host galaxies, which can drive star formation. To investigate the internal conditions of forming galaxies James Rhoads and Sangeeta Malhotra, both from Arizona State University, and colleagues targeted two young galaxies, known as S0901 and the Clone. The light from both galaxies has taken 10 billion years to reach us across space. Thus, we are seeing them when they were comparatively young. The Herschel observatory, a European space telescope for which NASA helped build instruments and process data, has stopped making observations after running out of liquid coolant as expected. The European Space Agency (ESA) mission, launched almost four years ago, revealed the universe’s “coolest” secrets by observing the frigid side of planet, star and galaxy formation. Confirmation the helium is exhausted came at the beginning of the spacecraft’s daily communication session Monday with its ground station in Western Australia. A clear rise in temperatures was measured in all of Herschel’s instruments. Herschel launched aboard an Ariane 5 rocket from French Guiana in May 2009. NASA’s Jet Propulsion Laboratory (JPL) in Pasadena, Calif., built components for two of Herschel’s three science instruments. NASA also supports the U.S. astronomical community through the agency’s Herschel Science Center, located at the California Institute of Technology’s Infrared Processing and Analysis Center in Pasadena. Herschel’s detectors were designed to pick up the glow from celestial objects with infrared wavelengths as long as 625 micrometers, which is 1,000 times longer than what we can see with our eyes. Because heat interferes with these devices, they were chilled to temperatures as low as 2 kelvins (minus 271 degrees Celsius) using liquid helium. The detectors also were kept cold by the spacecraft’s orbit, which is around a stable point called the second Lagrange point about 1.5 million kilometers (930,000 miles) from Earth. This location gave Herschel a better view of the universe. The mission will not be making any more observations, but discoveries will continue. Astronomers still are looking over the data, much of which already is public and available through NASA’s Herschel Science Center. The final batch of data will be public in about six months. “Our goal is to help the U.S. community exploit the nuggets of gold that lie in that data archive,” said Phil Appleton, project scientist at the science center. — Discovering long, filamentary structures in space, dotted with dense star-making knots of material. — Detecting definitively, for the first time, oxygen molecules in space, in addition to other never-before-seen molecules. By mapping the molecules in different regions, researchers are learning more about the life cycles of stars and planets and the origins of life. 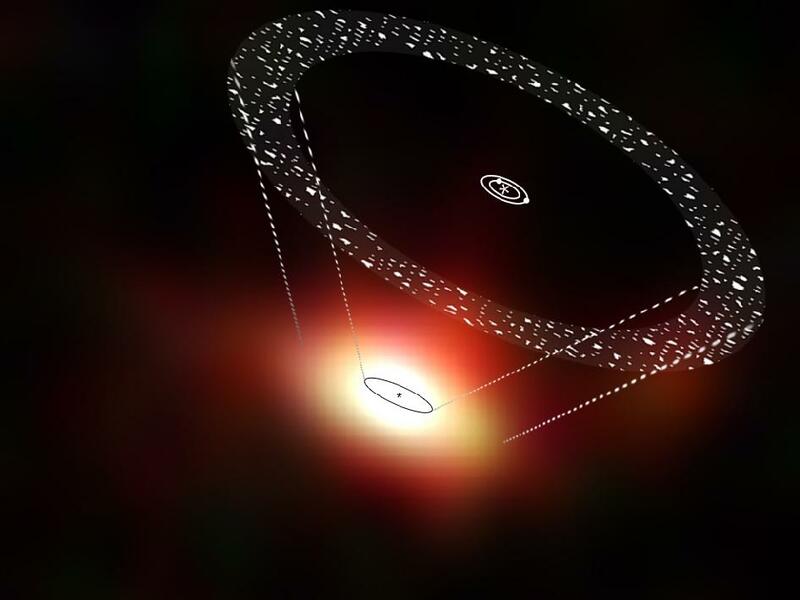 — Discovering high-speed outflows around central black holes in active galaxies, which may be clearing out surrounding regions and suppressing future star formation. — Opening new views on extremely distant galaxies that could be seen only with Herschel, and providing new information about their high rates of star formation. — Following the trail of water molecules from distant galaxies to the clouds of gas between stars to planet-forming solar systems. — Examining a comet in our own solar system and finding evidence comets could have brought a substantial fraction of water to Earth. — Together with NASA’s Spitzer Space Telescope, discovering a large asteroid belt around the bright star Vega. Other findings from the mission include the discovery of some of the youngest stars ever seen in the nearby Orion “cradle,” and a peculiar planet-forming disk of material surrounding the star TW Hydra, indicating planet formation may happen over longer periods of time than expected. Herschel also has shown stars interact with their environment in many surprising ways, including leaving trails as they move through clouds of gas and dust. 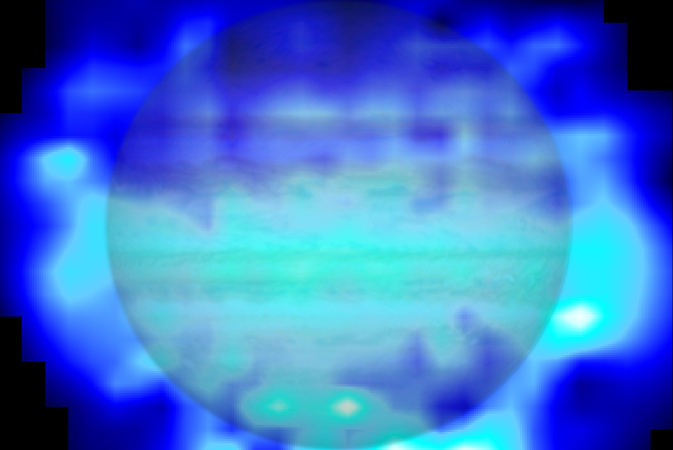 Astronomers have finally found direct proof that almost all water present in Jupiter’s stratosphere, an intermediate atmospheric layer, was delivered by comet Shoemaker-Levy 9, which famously struck the planet in 1994. The findings, based on new data from the Herschel space observatory, reveal more water in Jupiter’s southern hemisphere, where the impacts occurred, than in the north. Herschel is a European Space Agency mission with important NASA participation. The origin of water in the upper atmospheres of the solar system’s giant planets has been debated for almost two decades. Astronomers were quite surprised at the discovery of water in the stratospheres of Jupiter, Saturn, Uranus and Neptune, which dates to observations performed with ESA’s Infrared Space Observatory in 1997. While the source of water in the lower layers of their atmospheres can be explained as internal, the presence of this molecule in their upper atmospheric layers is puzzling due to the scarcity of oxygen there. Its supply must have an external origin. Since then, astronomers have investigated several possible candidates that may have delivered water to these planets, from icy rings and satellites to interplanetary dust particles and cometary impacts. Data from Herschel’s Photodetecting Array Camera and Spectrometer (PACS), with the help of NASA’s Infrared Telescope Facility, helped solve the mystery at Jupiter by showing an asymmetry in the distribution of water in its stratosphere, caused by the comet impact. Additional proof for a cometary source for the water came from Hershel’s heterodyne instrument for the far infrared (HIFI), which probed the vertical profile of water in the stratosphere. NASA’s Jet Propulsion Laboratory in Pasadena, Calif., helped build the HIFI instrument. The ring-like swirls of dust filling the Andromeda galaxy stand out colorfully in this new image from the Herschel Space Observatory, a European Space Agency mission with important NASA participation. The glow seen here comes from the longer-wavelength, or far, end of the infrared spectrum, giving astronomers the chance to identify the very coldest dust in our galactic neighbor. These light wavelengths span from 250 to 500 microns, which are a quarter to half of a millimeter in size. Herschel’s ability to detect the light allows astronomers to see clouds of dust at temperatures of only a few tens of degrees above absolute zero. These clouds are dark and opaque at shorter wavelengths. The Herschel view also highlights spokes of dust between the concentric rings. The colors in this image have been enhanced to make them easier to see, but they do reflect real variations in the data. The very coldest clouds are brightest in the longest wavelengths, and colored red here, while the warmer ones take on a bluish tinge. These data, together with those from other observatories, reveal that other dust properties, beyond just temperature, are affecting the infrared color of the image. Clumping of dust grains, or growth of icy mantles on the grains towards the outskirts of the galaxy, appear to contribute to these subtle color variations. These observations were made by Herschel’s spectral and photometric imaging receiver (SPIRE) instrument. The data were processed as part of a project to improve methods for assembling mosaics from SPIRE observations. Light with a wavelength of 250 microns is rendered as blue, 350-micron is green, and 500-micron light is red. Color saturation has been enhanced to bring out the small differences at these wavelengths. By combining the observing powers of ESA’s Herschel space observatory and the ground-based Keck telescopes, astronomers have characterised hundreds of previously unseen starburst galaxies, revealing extraordinary high star-formation rates across the history of the Universe. Starburst galaxies give birth to hundreds of solar masses’ worth of stars each year in short-lived but intense events. By comparison, our own Milky Way Galaxy on average produces the equivalent of only one Sun-like star per year. Starburst galaxies generate so much starlight that they should outshine our Galaxy hundreds to thousands of times over, but the enormous quantities of gas fuelling them also contain vast amounts of dust as a result of the frantic star formation. The dust absorbs much of the visible light, meaning that many of them look quite insignificant in that part of the spectrum. However, the dust is warmed by the surrounding hot stars and re-emits the energy at far-infrared wavelengths. Using ESA’s infrared Herschel space observatory, astronomers measured the temperature and brightness of thousands of dusty galaxies. From these, their star-formation rate could be then calculated. 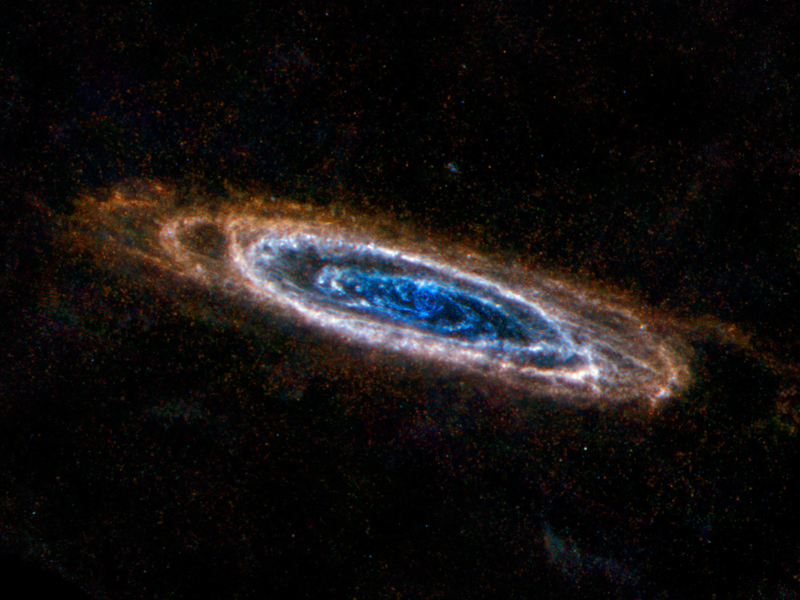 “Starburst galaxies are the brightest galaxies in the Universe and contribute significantly to cosmic star formation, so it’s important to study them in detail and understand their properties,” says Dr Caitlin Casey of the University of Hawai‘i, lead author of the papers discussing the results in the Astrophysical Journal. To provide context to the observations and understand how star formation has changed over the Universe’s 13.7 billion year history, the distances to the galaxies were also needed. With Herschel signposting the way, Dr Casey’s team used spectrometers on the twin 10-metre W.M. Keck telescopes on Mauna Kea, Hawai‘i, and obtained the redshifts of 767 of the starburst galaxies. Redshifts provide astronomers with a measure of how long the light from each galaxy has travelled across the Universe, which, in turn, indicates when in cosmic history the light from each galaxy was emitted. For most of the galaxies it was found that the light has been travelling towards us for 10 billion years or less. About 5% of the galaxies are at even greater redshifts: their light was emitted when the Universe was only 1–3 billion years old. “The Herschel data tell us how fiercely and prolifically these galaxies are producing stars,” says Seb Oliver from University of Sussex, UK, and Principal Investigator for the HerMES Key Programme, within which the data have been collected. How such large numbers of starburst galaxies formed during the first few billions of years of the Universe’s existence poses a vital problem for galaxy formation and evolution studies. One leading theory proposes that a collision between two young galaxies could have sparked an intense short-lived phase of star formation. Another theory speculates that, when the Universe was young, individual galaxies had much more gas available to them to feed from, enabling higher rates of star formation without the need of collisions. “It’s a hotly debated topic that requires details on the shape and rotation of the galaxies before it can be resolved,” adds Dr Casey. “Before Herschel, the largest similar survey of distant starbursts involved only 73 galaxies – we’ve improved on that by over a factor of ten in this combined survey with Keck to determine the characteristics of this important galaxy population,” adds Göran Pilbratt, ESA’s Herschel project scientist. This artist’s impression shows the orbits of planets and comets around the star 61 Vir, superimposed on a view from the Herschel Space Telescope. The line drawing gives a schematic representation of the location and orientation of the star, planets and outer debris disk of comets, albeit not to scale. 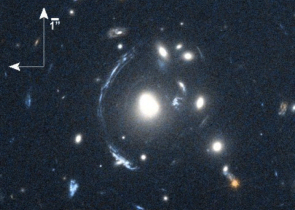 The black oval outline sketched onto the Herschel data represents the innermost boundary of the debris disk; the approximate location of the outermost boundary is represented by the outer set of dashed lines. It is not possible to identify the central star due to smearing of the Herschel data. Supernova remnant W44 is the focus of this new image created by combining data from ESA’s Herschel and XMM-Newton space observatories. W44 is the vast purple sphere that dominates the left hand side of this image, and measures about 100 light-years across. W44 is located around 10,000 light-years away, within a forest of dense star-forming clouds in the constellation of Aquila, the Eagle. 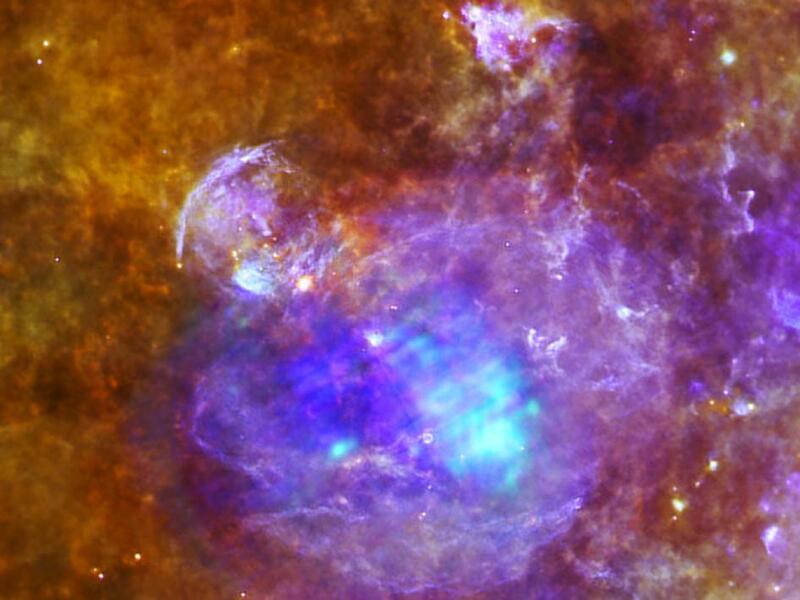 It is one of the best examples of a supernova remnant interacting with its parent cloud. The supernova remnant is the result of massive star that reached the end of its life and expelled its outer layers in a dramatic explosion. All that remains of the stellar behemoth is the spinning core of a neutron star, or pulsar. Identified as PSR B1853+01, the pulsar is the bright point to the top left in W44, colored light blue in this image. It is thought to be around 20,000 years old. Like other pulsars, as it rapidly rotates, it sweeps out a wind of highly energetic particles and beams of light ranging from radio to X-ray energies. The center of the supernova remnant is also bright in X-rays, coming from the hot gas that fills the shell at temperatures of several million degrees. Dense knots of high-energy emission reflect regions where heavier elements are more commonly found. At the cooler edge of the cavity, gas is swept up as the supernova remnant propagates through space. At the top right of the expanding shell, there is a smaller cavity, with the shock from the supernova remnant impacting the bight arc-shaped feature. This region is filled with hot gas that has been ionized by the intense ultraviolet radiation from embedded young massive stars. Herschel’s infrared eyes seek out regions of gently heated gas and dust further from W44, where new stars are congregating. Examples include the arrowhead-shaped star-formation region to the right of W44, which appears to point to another trio of intricate clouds further to the right and above. 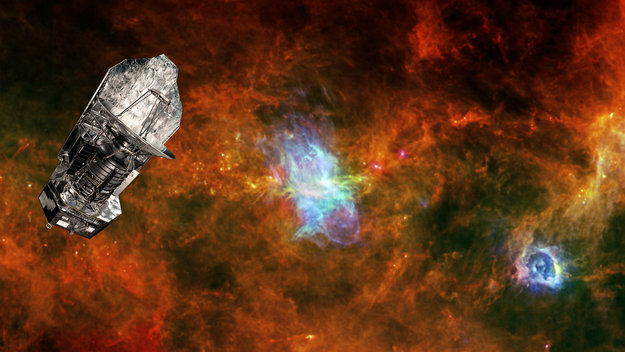 Herschel’s three-color infrared view comprises data from the Photodetecting Array Camera and Spectrometer (PACS) at 70 and 160 microns, and Herschel’s spectral and photometric imaging receiver (SPIRE) instrument at 250 microns. X-ray data from XMM-Newton for W44 has been added in light and dark blue to represent high- and low-energy X-ray emission, respectively. The field of view is about one-degree across. North is towards the bottom left of the image; east is to the top right.